Cartoons and comics often get blamed for soliciting products to children. Many characters have been used to sell sugary cereals, candy, and other various teeth-rotting foods. The Masters of the Universe cartoon was a thinly-veiled commercial for the action figures. But the sad story I am about to tell you might be the lowest a fictional character has ever sunk to sell something. At some point in my childhood, cigarette gum fell out of favor with the general public. This probably has something to do with the fact that is is a cigarette. For kids. This is one of those critical views I can at least see the logic behind. Unlike, say, the idea that Big League Chew would lead to kids wanting chewing tobacco. The downside to cigarette gum disappearing is that cigarette gum is awesome. You would blow on them, and powder would shoot out, resembling smoke. And then the gum would have the paper wrapper stuck to most of it, rendering half the gum inedible. But at least the gum you were able to salvage tasted delicious. Wait. No, it didn’t. Okay, never mind. Except for the very brief novelty thrill, cigarette gum wasn’t very good. Besides the nostalgia filter and the novelty attached to them, I think the main reason we remember cigarette gum fondly is because it is often compared to its dreadful relative – candy cigarettes. 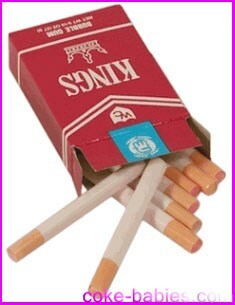 Candy cigarettes took the worst aspects of cigarette gum, and made them even less desirable. Gone was the puff of smoke. Instead, the “novelty” for the candy version was simply a red-colored tip (“It looks just like fire!”). You might think the lack of a wrapper was an upside, because it wouldn’t adhere to the candy. The problem with this was, since you were able to eat the whole stick… you had to eat the whole stick. And they were terrible. They were, essentially, a Fun Dip stick with less flavor. Soon, the general public thought “Wait, why are candy cigarettes okay for kids, but cigarette gum isn’t? I don’t think the gum aspect was the issue.” The problem was, everyone loved candy cigarettes, they couldn’t just take them off the market! Or, more likely, the problem was that they had mountains of the terrible-tasting ingredients required to make candy cigarettes, and they had to be used for something. Somehow, Popeye became the man to lead this transition. Popeye had is own line of candy cigarettes. Which makes plenty of sense when you remember that Popeye is so well known for smoking cigarettes and eating candy. Wait, no, I’m confusing things. He was famous for smoking a pipe and eating spinach. So how did Popeye get mixed up in all of this? Once the pressure was on, Popeye transitioned his cigarettes into simple sticks by removing the red coloring on the tip. Problem solved! 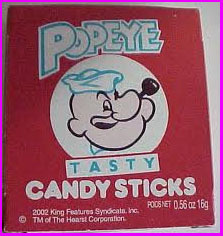 Popeye candy sticks are something I distinctly remember getting in my pumpkin. And despite being a child with no real discernable tastes, even I could tell these things were filler candies. Be glad you didn’t pay to read this, because this “history” lesson is a mix of assumptions, guesswork, and my vague childhood Trick or Treating memories. Candy sticks are one of those things that shouldn’t exist any more. It seems the only way you could get someone to even buy them is to take what the very likely cheap ingredients, and spend a little money to get a well-known license and trick kids into wanting them. But they wouldn’t sink that low, would they? 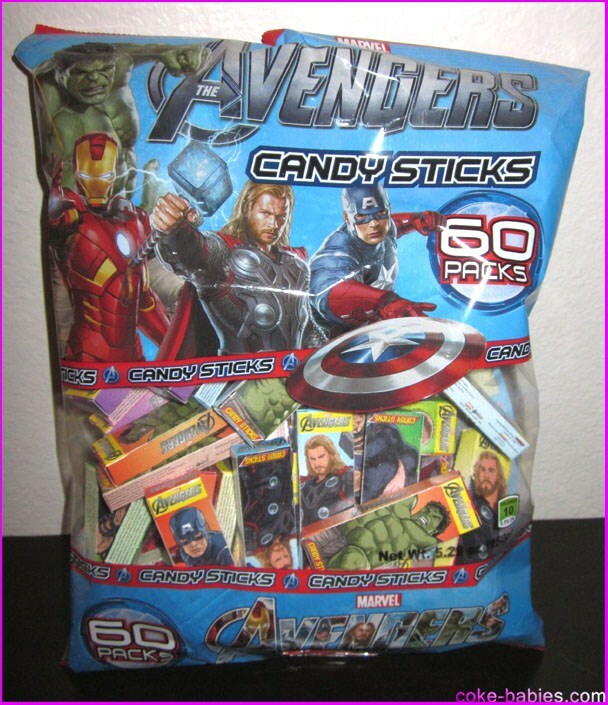 I guess one complaint you can’t have about Avengers candy sticks is the price. You get sixty two-packs for about $2. Also, it’s pretty smart packaging, where they decided to leave off the two least popular Avengers, Hawkeye and Black Widow, in order to make increase the size of the big four of Iron Man, Thor, Captain America, and the Hulk. This also might possibly be due to the fact that anyone foolish enough to get suckered into buying these isn’t old enough to be interested in Black Widow, anyway. The packaging is nice looking, with one side featuring a single Avenger, and the other side two of them fighting together. Everything seems good so far! And that’s the end of that. No more goodness. Making matters worse, the sticks are bubble gum flavored. The only time something should be bubble gum flavored is when is is bubble gum. Possible exception can be made for the pink amoxicillin you keep in the refrigerator. 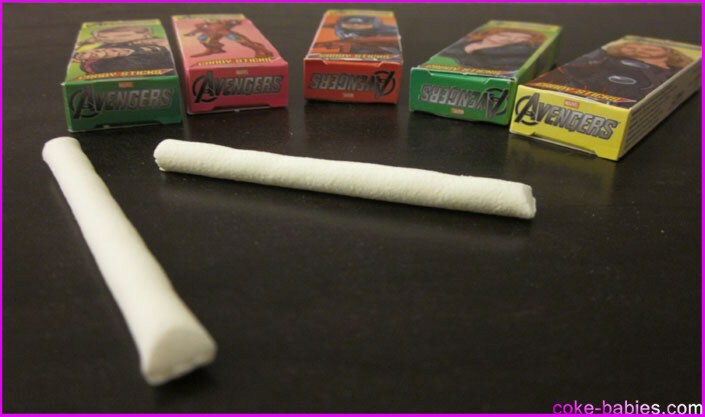 Hard, chalky, unpleasant taste, boring aesthetics – Avengers candy sticks have it all! They’re hidden in nice packaging, but as always, candy sticks take their place at the bottom of the Halloween candy desirability rankings. 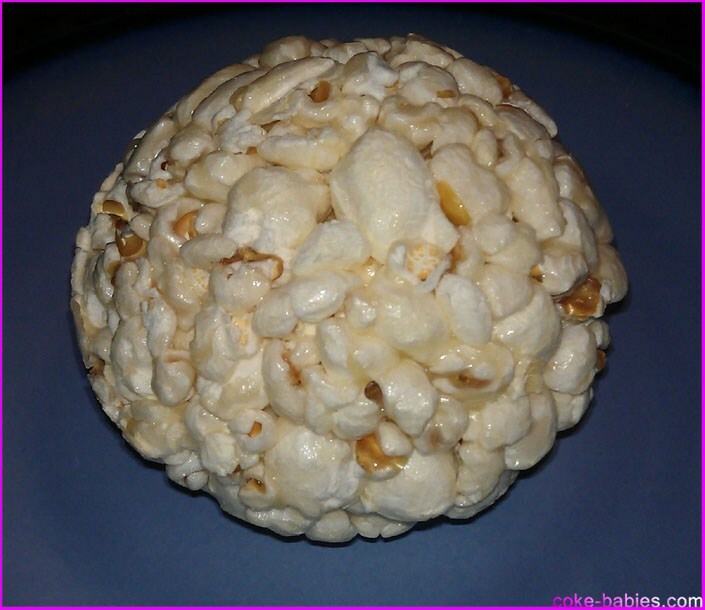 Despite them being one of the greatest foods ever created, it’s hard to review specific popcorn balls. This is mostly due to them being something of a commodity, where even though many brands make them, they are very similar. There are exceptions, of course. 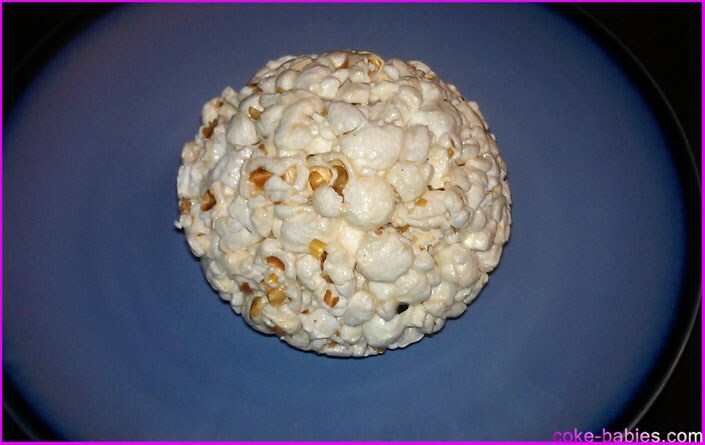 You can probably find plenty of “gourmet” popcorns balls, where they texture and taste approaches home-made quality. I want a dozen popcorn balls for $5, and I want to grab them off a store shelf. I love the hell out of them, but when it comes to putting in effort, I have my limits. Usually, I have to count on Act II to fulfill my pre-packaged popcorn ball needs. When I first brought up popcorn balls as an upper echelon Trick or Treat giveaway, Act II was the example given. However, this year they were alarmingly absent. Even online, their popcorn ball presence is missing. A Google search for “Act II Popcorn Balls” results in Act II’s page as the second result. The first result is a Target page that suggests you buy a children’s ball pit, instead. And while it’s hard to argue that logic, since that is an awesome thing to own, it’s not very helpful. The first result that mentions them is an Amazon page that tells you they are unavailable. What is going on? I had become worried that my Halloween food pyramid’s recommended two daily servings of popcorn balls would not be reached. Thankfully, at least two brands have stepped in to fill the void. “Ghoulish Gourmet” seems to be one of Walmart’s in-house brands. Oddly enough, they don’t seem to put anything else under this label, that I could find. So Walmart gets it. Popcorn balls are so necessary that if you have to make an entire line, just for one product, that’s what needs to happen. I like the packaging, because the “Popcorn Balls” logo looks like something I’d do for my site, and think it looks really good. Despite, of course, it looking like the heading a Cradle of Filth Geocities fan page in 1998. The individual wrapping isn’t much different, but I am beginning to appreciate their efforts to make the orange as bright as possible. Part of this is due to my atrocious photography skills, where I think it’s a good idea to get really close and leave the flash on. But for the most part, the orange actually is this bright in real life. One odd thing about both popcorn balls I got this year, and I think this applies to Act II as well – they’re not actually spherical balls. From the top, they look like a baseball, but from the sides they look like a fatter football. I suppose that description wouldn’t be as catchy and would make the label a bit cramped, so “balls” it is. The Ghoulish Gourmet ball was really good, despite a couple of flaws. One of those flaws added a bit of enjoyment for me, but the general public might not be as into it. A few of the kernels were burned, so a couple bites had that burned microwave popcorn flavor. I actually like a bit of that. I think that’s due to the fact that while growing up, my dad would microwave popcorn for about seven minutes, resulting in a solid block of charcoal. He liked it like that for some reason – I guess a tiny bit of that wore off on me. The other downside was that I got an unpopped kernel in one of the balls. This is to be expected at the bottom of the bowl when microwaving popcorn. In the rare instance where I make a bowl of popcorn and don’t have a single unpopped kernel, my level of pride is embarrassingly high. But when you’re taking a bite and chewing, an unpopped kernel is a very unwelcome surprise. 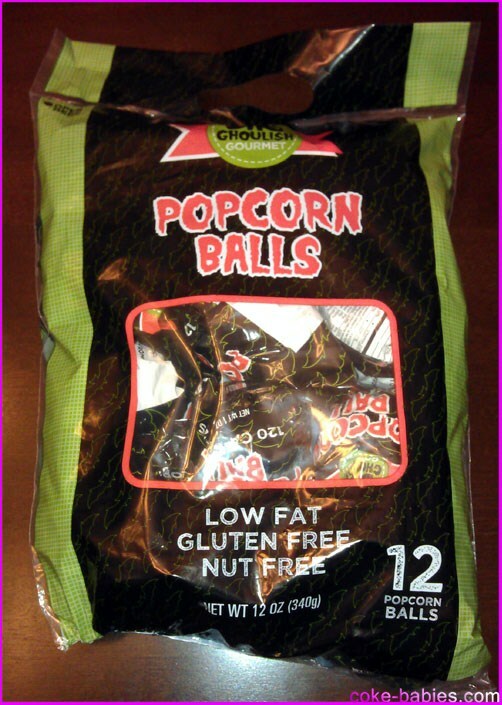 The other popcorn ball I found was from a company a lot of people have probably heard of – The Popcorn Company. Their popcorn balls came individually wrapped, in a decidedly less “Halloween”-y design. It’s orange, but that’s where they stopped. This is possibly to hedge their bets, and keep them on the shelves for the rest of Fall. The label is a little odd. First, I was a bit alarmed when I saw, “Celebrate… Deliciously! *” I thought at first it was an asterisk, and was rather upset as to what they might need to clarify in their footnote. A second look revealed it was actually the registered trademark symbol, so I was able to calm down. A couple minor issues I have with the packaging – first, it looks like there should be a fourth popcorn with a phrase on it, at the bottom left. The balance looks all wrong. Secondly, “Limited Offer!” seems like either a strange way of putting it, or it’s just strange that they feel that’s one of the top three selling points. The Popcorn Factory’s popcorn ball looked almost identical to Ghoulish Gourmet’s. The two biggest difference was the Popcorn Factory’s texture was a bit softer, and the glaze looked a little more tan. 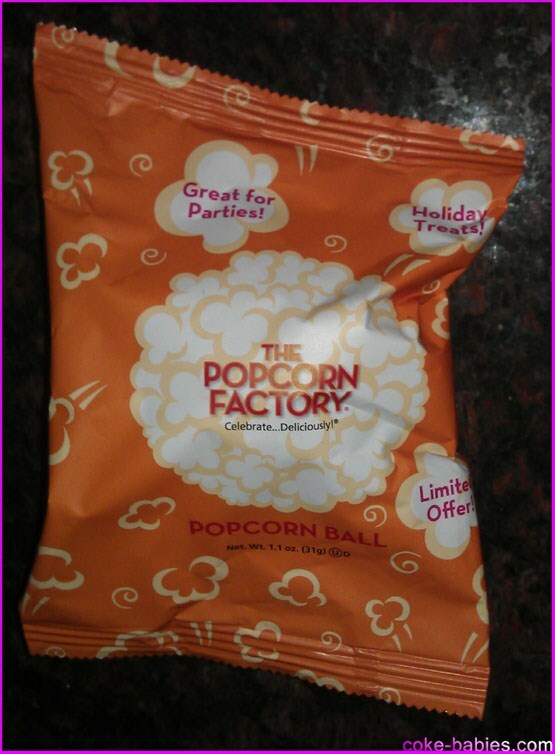 Taste-wise, the Popcorn Factory’s ball is really good. 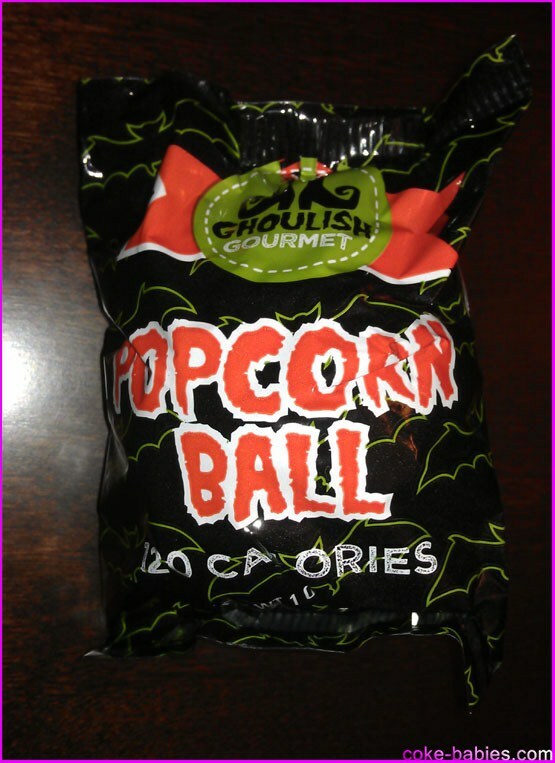 It seems to be a hint sweeter than Ghoulish Gourmet’s, but that seems to actually balance better with the very light saltiness and toasty popcorn flavor. Of the two, I’d give the edge to Popcorn Factory’s effort. Both company’s put out very good popcorn balls, and there are probably many others out there that I just didn’t see. So if you see any – buy them. Eat them by the dozen, and buy more to give away on Halloween. We need to return this country to its glory days – when popcorn balls were something you would see in a child’s pumpkin. By this point, it’s hard to give a fair analysis or review to Monster Cereal products. The nostalgia has become too embedded in them to allow anyone to give an unbiased assessment. And if, by the slimmest chance, you are able to give a fair review due to not having fond memories of Monster Cereals, it most likely means you are a heartless, awful person. 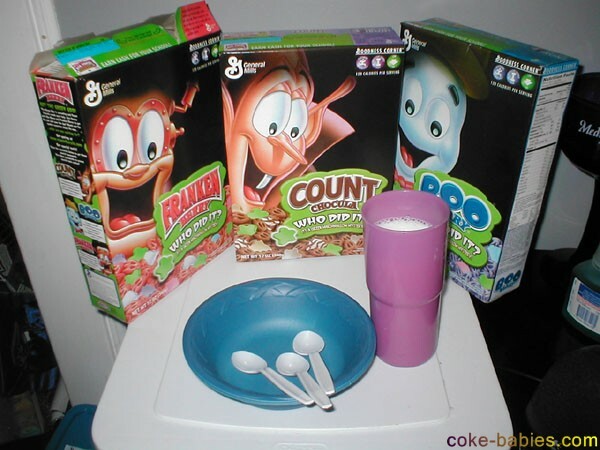 Nostalgia is the only reason I can think of that causes people to declare how much they love Boo Berry cereal. It’s not disgusting, it’s just… not very good. I reviewed the Monster lineup way back in 2004, and didn’t understand the hype back then, either. However, since that initial review, I have come to like Franken Berry much more, and it is probably tied with the Count for the top spot. The Count’s cache has decreased a bit since discovering that Chocolate Lucky Charms are almost identical. I have also discovered indisputable evidence that Boo Berry is the worst of the three. Since they have the same last name, we can assume that Franken and Boo Berry are brothers. But when they both died, Franken was the one who was resurrected. They just left Boo’s corpse to rot. Maybe when it came time to hit the “make this cereal awesome” button at the factory, Boo’s ghostly hand passed right through and was unable to press it. That said, I don’t hate Boo Berry – he seems like a nice enough ghost. 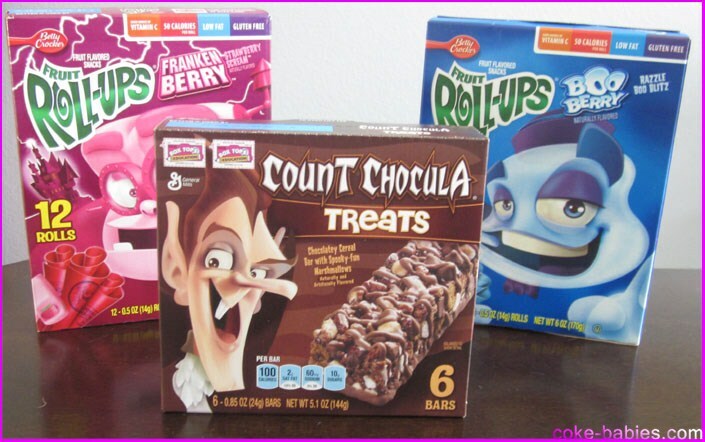 Since I love Halloween and Monster Cereals, and since fruit rolls make up approximately 30% of my diet, it makes sense that I’d finally get around to trying the Monster Cereals Fruit Roll-Ups. 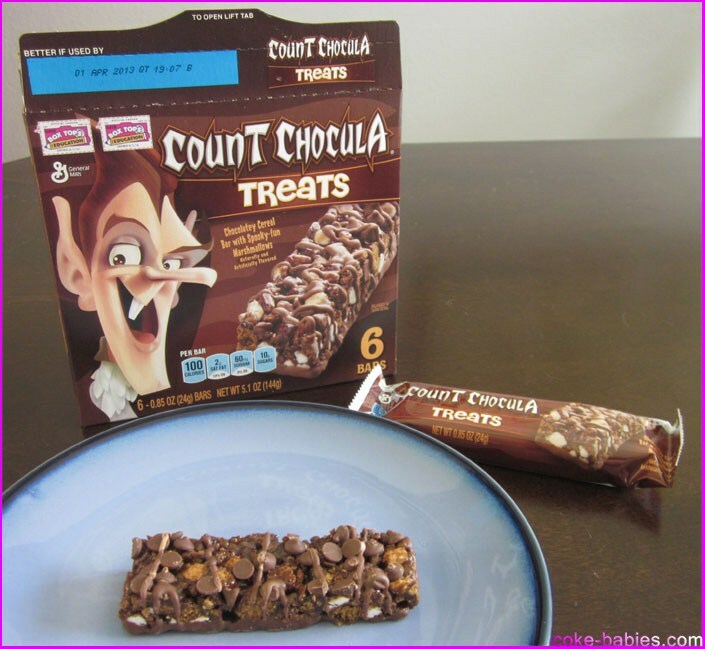 And since it would be awkward to only review two-thirds of the group, Count Chocula’s Treats get to come along for the reviewing ride. I hope you really enjoyed that long introduction to the review, because there’s not going to be too much to say about all three of these. Franken Berry’s Fruit Roll-Ups come in an intensely pink box. One very noticeable peculiarity is that Franken paints strawberries on his fingernails. I buy that he has pink-hued skin, but no way are those strawberry fingernails natural. He did that. I also never understood why Franken apparently has goggles bolted onto his face. That’s not a Frankenstein thing. But he also has steam gauges and pipes coming out of his head, so I guess they sort of went their own way when designing him. 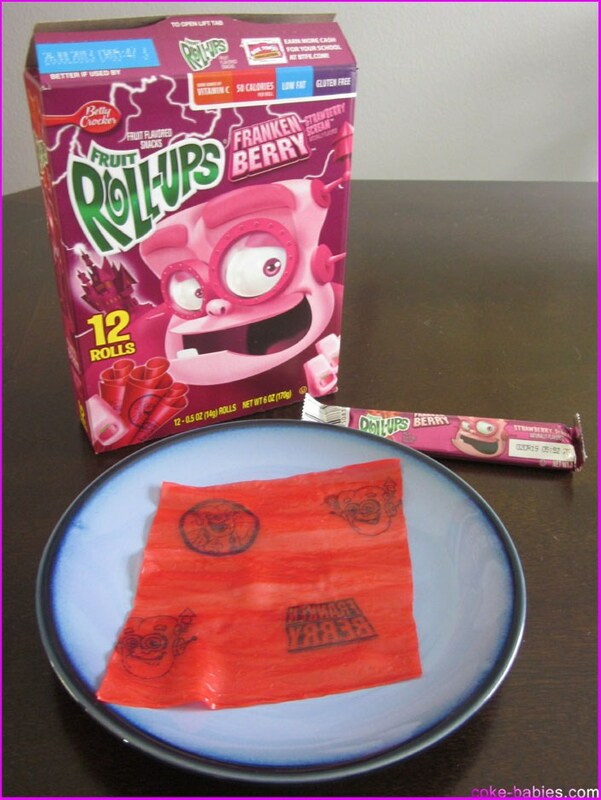 Oh yeah, the Franken Berry Fruit-Roll Up. It’s called “Strawberry Scream”, but it’s just a strawberry Fruit Roll-Up. So, there you go. It just looks like I went to a club the night before. 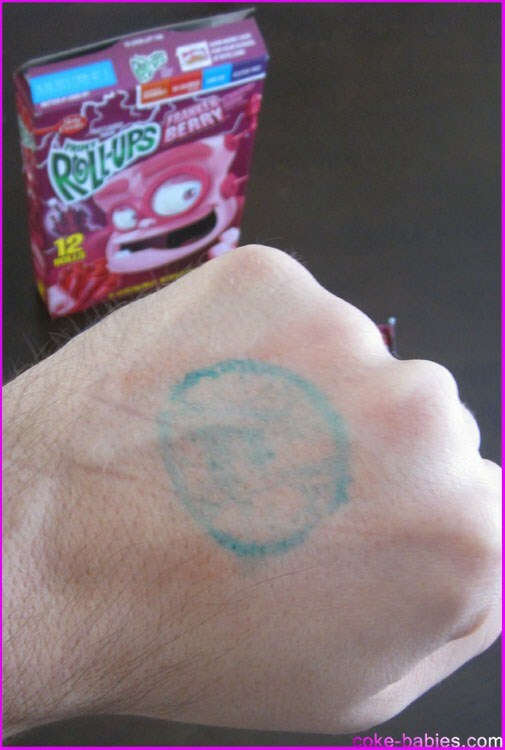 And since I find that concept much more embarrassing than the concept of stamping myself with Fruit Roll-Up tattoos, I am rather disappointed. Up next is the other friendly ghost’s offering. Boo’s flavor is “Razzle Boo Blitz”, which is just a re-theme of an existing Fruit Roll-Up flavor. I can’t 100% tell if the flavor is Blastin’ Berry Hot Colors or Tropical Tie-Dye. I’m leaning more towards Blastin’ Berry, especially because of it having berry in its name. I’ve always liked those flavors a lot more than strawberry, so in the Fruit Roll-Up field of battle, Boo takes a rare victory over Franken. Finally, we have the Count. Immediately, his lack of effort annoyed me. 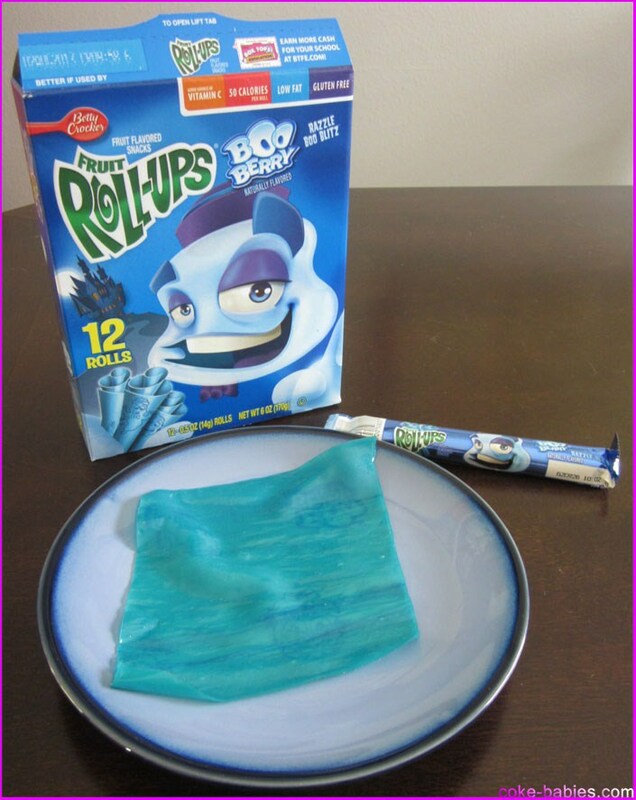 When I saw that the Berry brothers had Fruit Roll-Ups, I was briefly excited at the prospect of the return of Pudding Roll-Ups. We’ve had chocolate Roll-Ups before, and we need them again. And the Count was the man to bring them back. Instead, he came with a pathetic offering of a glorified granola bar. I really like some of General Mills’s Treats bars. The Golden Grahams one is insanely good. The Cinnamon Toast Crunch Treats? Surprisingly not good. So while I was incredibly disappointed over the Count not coming correct with a chocolate roll, I was willing to give this a shot. And it’s… very mediocre. It’s a Kudos bar with some Count Chocula pieces mashed in there. Poor show, Count. So Boo comes out on top in the Monsters’ side project lineup. Hopefully that will boost his spirit (rim shot again) enough so he can kick the booze habit and regain his healthy appearance from the past. 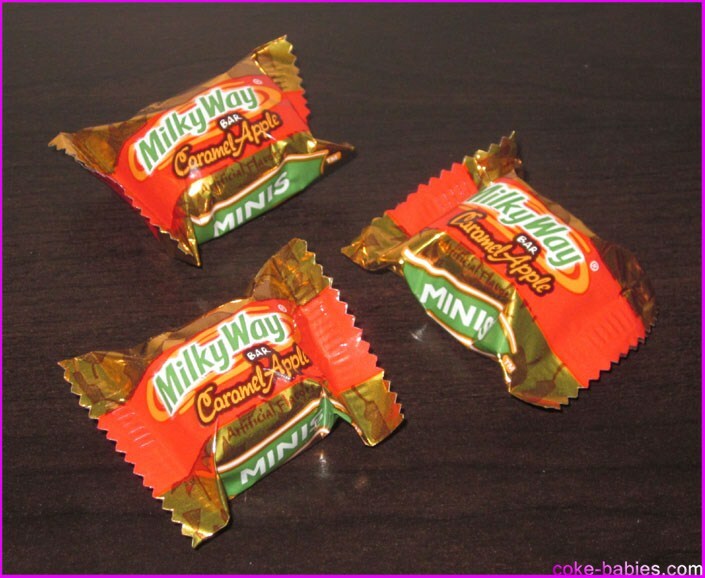 Today continues the trend from the last review, Milky Way Caramel Apple, where “Autumn”-themed candy gets lumped in with Halloween-themed candy. Unless it’s a Jones Soda-type Thanksgiving flavor, Halloween and Christmas are the only end of the year holidays that get their own candy theme. 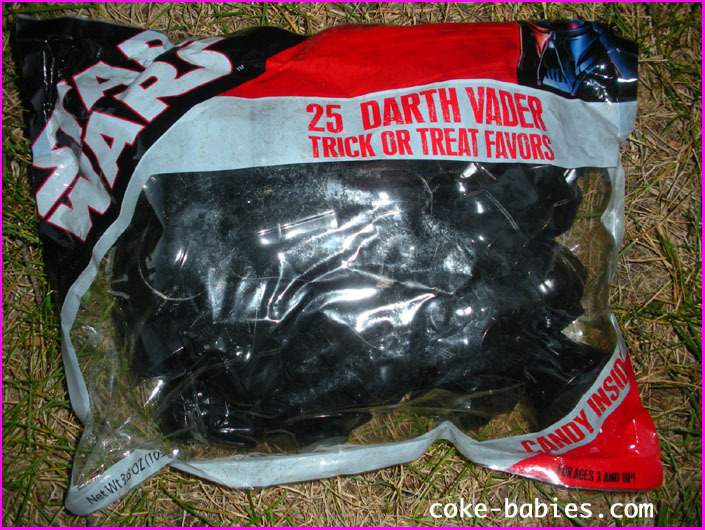 One exception: if you would like to send me free candy, to be reviewed after Halloween but before Christmas, I will make an exception. I’m easily persuaded by free candy, which explains the numerous kidnapping attempts made on me as a child. 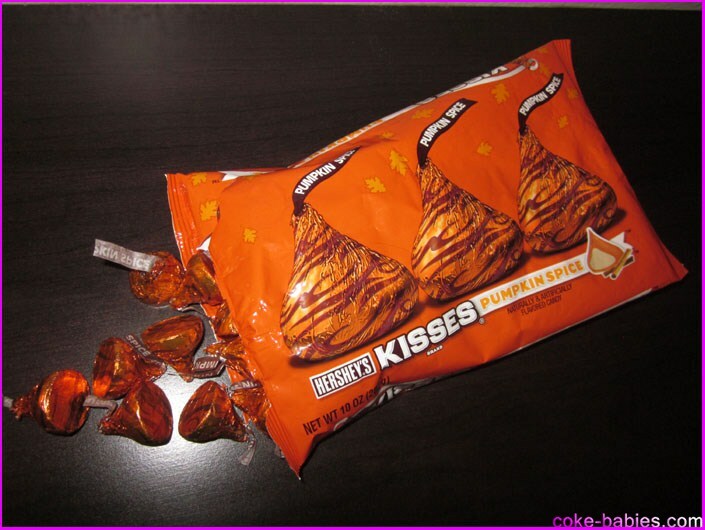 Pumpkin Spice Hershey’s Kisses aren’t new, but they are new to me. In previous years, they either received limited distribution from Hershey, or received limited attention paid by me. History shows I should assume the latter is the reason. Full disclosure off the bat: it is taking a lot of willpower to call them “Hershey’s Kisses”, since when referring to them, I always just call them “Hershey Kisses”. But if there is one thing this site is known for, it is my adamant belief that accuracy is of utmost importance. Hershey’s Kisses are always one of those “Oh, there they are” candies, that I don’t get excited for, but will occasionally be happy that they are around. This is mostly when it’s the almond or dark chocolate Kisses. Almost all of the others, I won’t bother with. 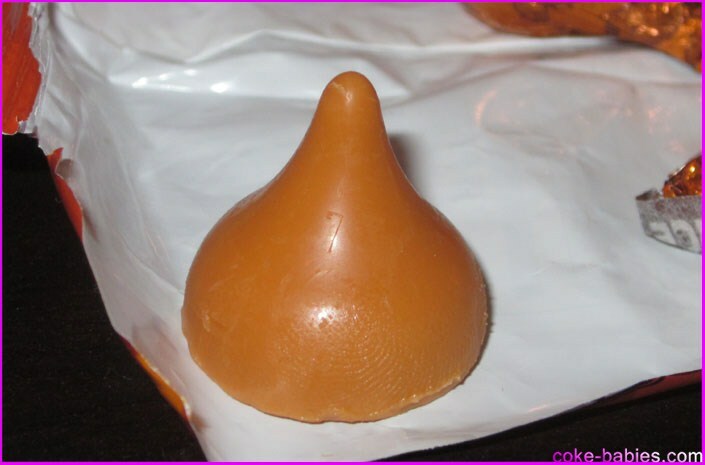 I also need to specifically mention that the Cherry Cordial Kisses are disgusting. Which is somewhat odd, since I like actual cherry cordials. But I guess based on the taste, Hershey decided to add Robitussin to the ingredients, which put me off eating them. Back to the matter at hand (Pumpkin Spice Kisses, in case you forgot), I mostly bought these because I’m a sucker for anything pumpkin-flavored. Not actual pumpkin flavor, since that’s pretty disgusting by itself – “pumpkin” flavored would be the more accurate term. When I found the bag, I was happy until I looked closer. The depiction of the Kiss on the bag showed it being orange, with a cream-colored center. 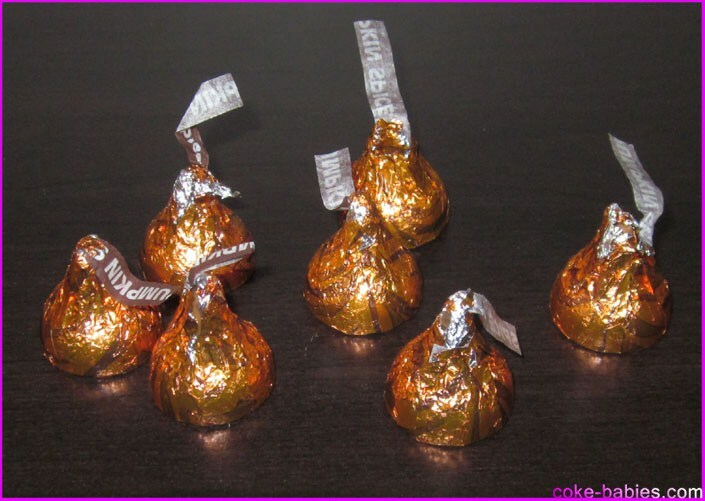 Orange-colored chocolate meant in all likelihood, this Kiss was going to be made of white chocolate. Ugh. White chocolate is always the (oh no… I swear this is unintentional) kiss of death of death for me. It’s vile. Intrepid investigator that I am, I still soldiered on. Unwrapping the Kiss, I am met with what appears to be the orange piece from the board game “Sorry”. It has an incredibly unnatural appearance, due to both the color and shine. It literally looks like a small candle. As you can see, the very soft texture made my fingerprint embed into the surface despite my applying almost no pressure. I would highly discourage you from using one of these as a murder weapon, because you will be caught. 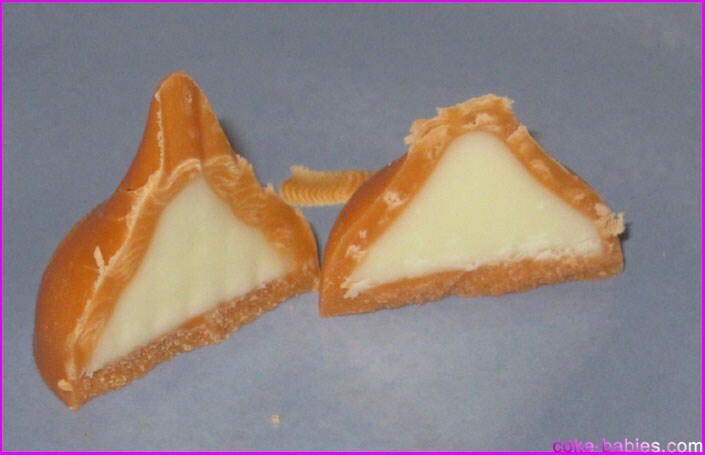 The white chocolate shell provides a creepy, mushy bite, revealing its creamy white innards. The first flavor is a brief flash of white chocolate unpleasantness. However, that is quickly washed away by the overwhelming “pumpkin” flavor. That’s “pumpkin” in extreme quotation marks. Pumpkin-flavored foods often overdo it with the spices. The logic presumably being “just carpet bomb them with spices, and they will be reminded of Fall!” This line of thinking was definitely in place for the creation of Pumpkin Kisses. The pumpkin flavor is just overwhelming, and rather strange. Between the appearance, the white chocolate flavor, and the very artificial-tasting pumpkin flavor, everything about the Kiss looks and tastes fake. I still have approximately sixty more of these in the bag, and I’d say the likelihood of me eating any more is extremely low. I’d give them out on Halloween, but I don’t want kids to come back and vandalize my house after eating them. 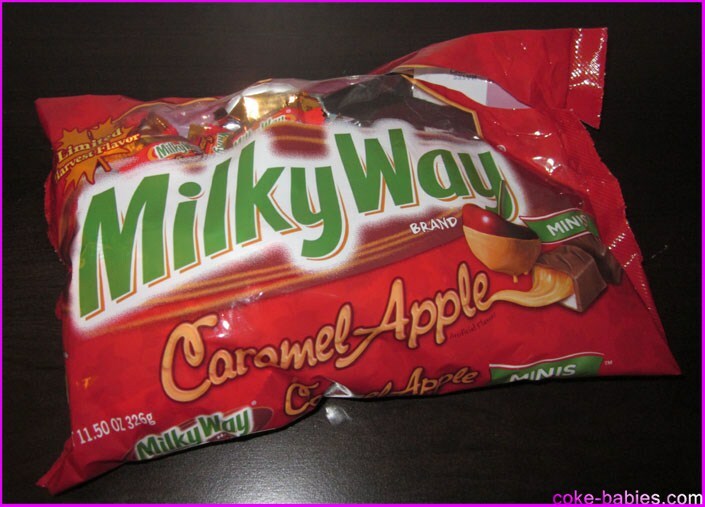 That lapse in judgment is what caused me to buy Milky Way’s new Halloween offering: Milky Way Caramel Apple. I assumed this review would be rather tokenistic, based on the simple arithmetic of I don’t like Milky Ways + I don’t like apple-flavored candy. And, yet, here I am: the proud owner of a giant bag of candy I’m predisposed to dislike. Mars, the parent company who makes Milky Ways, was smart with the packaging. Technically, it’s an “Autumn” product, not a Halloween product. But if I have to start adding more times of year that food can be themed for, I will get thrown out of whack. So for my purposes, this a Halloween-themed candy. The individual wrappers look similar to the ones I’m already familiar with, as I look at them and leave them in the candy dish in favor of something better. The nougat color looks much lighter than normal, maybe due to it being apple-flavored. I can’t be sure without actually comparing them to a normal Milky Way, and that amount of research seems exhausting, so I’m not going to do that. Surprisingly, the flavor is quite good. My apple-flavored candy hatred is almost exclusively aimed at “sour” apple, so maybe normal apple is a flavor I’d be willing to give a shot to more often. The apple flavor has the apple (surprising, I know), but also some of the fall spices you associate with apple pie or cider. While it is obviously sweet, I was expecting a much more cloying sweetness, which I was happy to find was not there. Despite the Milky Way Caramel Apple being much better than anticipated, they seem like one of those “unique” flavored candies you can only have a few of at a time. Of course, some might say you should only have a few pieces of candy at a time anyway, but that’s foolish talk. 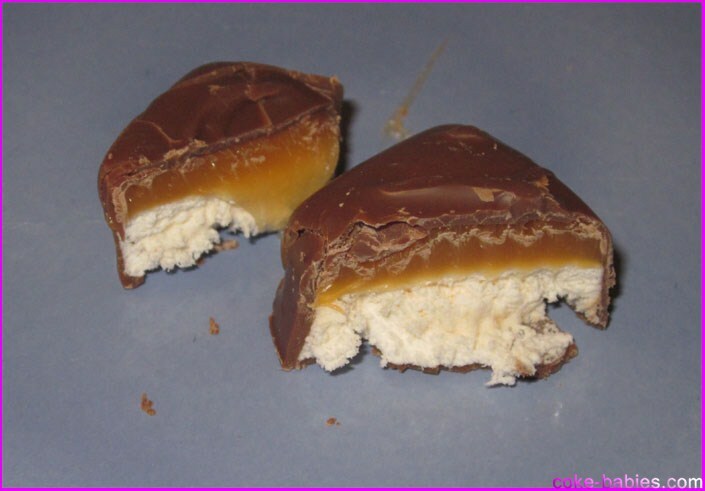 I would advise Mars to make more themed Milky Ways, for whatever holiday or season they feel like using, or even inventing. The themed versions are clearly better than the standard ones, so we might as well get as many different themes as we can. When it comes to food being re-themed for a holiday, Christmas reigns supreme, followed by Halloween. 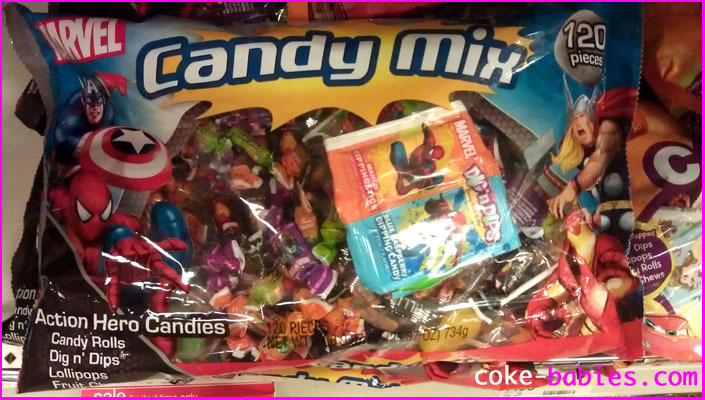 Unfortunately, many companies take the lazy route for Halloween, and just make the packaging “spooky” or add some token Halloween aspect. 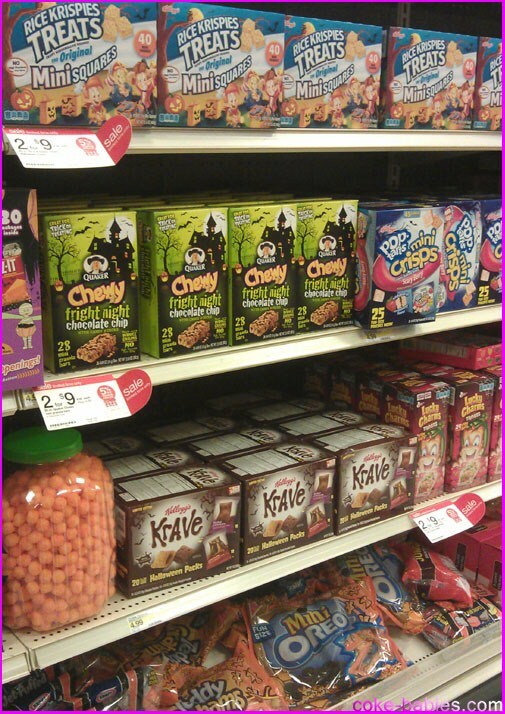 Plenty of offenders can be seen here: Krave, Lucky Charms Treats, Mini Oreos, and more just repackage to get on the Halloween bandwagon. Quaker at least had the decency to add some orange and black sprinkles to their granola bars to get their foot in the haunted door. The Cadbury Screme egg is another example of companies doing just slightly more than the bare minimum to get their products qualified to be in a Halloween display. So when companies legitimately re-theme a product through at least something of a significant change, it is always greatly appreciated. Halloween Crunch is not a new release. But when the good Cap’n is willing to go the extra mile to decorate his ship’s food for Halloween, it deserves special notice. This year’s box design is nice and eye-catching. Lots of Halloween orange and various shades of green. When did we all agree that green was allowed to be a Halloween color? I guess it’s the color of… slime? Between the box, the milk (which we’ll get to), and lots of other companies splashing green all over their Halloween boxes, somehow this became an acceptable themed hue. To me, Halloween’s official colors will always be orange and black. If it’s good enough for the wrappers of those peanut butter chews, that’s enough for me. The green shade had me convinced the box should glow in the dark. Despite my insistence that these shades of green must indicate glowing in the dark, it doesn’t. Feel free to try, though. It will provide seconds of entertainment! The promise of the ghosts turning the milk green had me more excited than I care to admit. I was really hoping the color change wouldn’t be a let down, since I had based so many of my recent life goals on this miraculous change. The back of the box is a slight step up from the “Mazes and Puzzles” you usually get when a kids cereal refuses to include a prize. 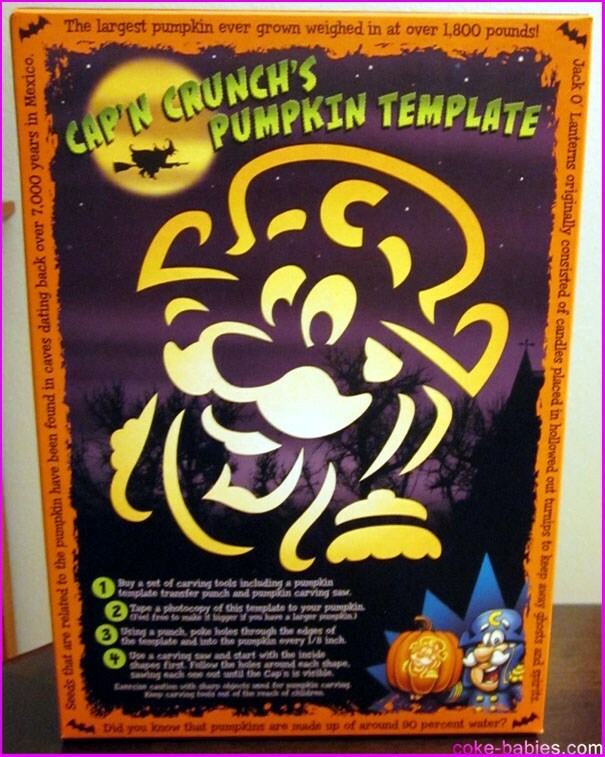 The Cap’n Crunch jack-o-lantern stencil is at least unique. Although I am not going to use it – carving a pumpkin is a once a year thing for me due to the grotesque seed removal process, and incredibly unpleasant smell. So if I’m carving one pumpkin, unfortunately the Cap’n’s head is not my go-to design. The back is also chock full of pumpkin facts. By “chock full” I mean four, but I think we can agree four facts about pumpkins is enough. Reviewing the cereal itself is a quick and easy process: It’s Crunch Berries. The berries have been replaced with orange ghosts, and that’s about it for the difference. The taste was good, since Crunch Berries are a reliable cereal. But the pressing concern was the milk change. My bowl had one green-spotted ghost, and I was worried that this ghost would be responsible for changing all of the milk. 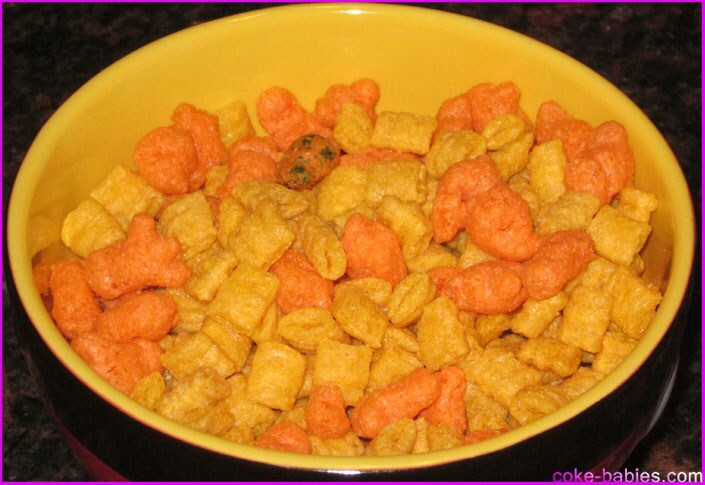 While making my way through the cereal, however, more ghosts became green-spotted as the milk wore them down. The color change took effect fairly quickly – these ghosts were efficient. Another plus was that it wasn’t a pale, “Hey, we tried” shade of green. The milk got legitimately green-ified. 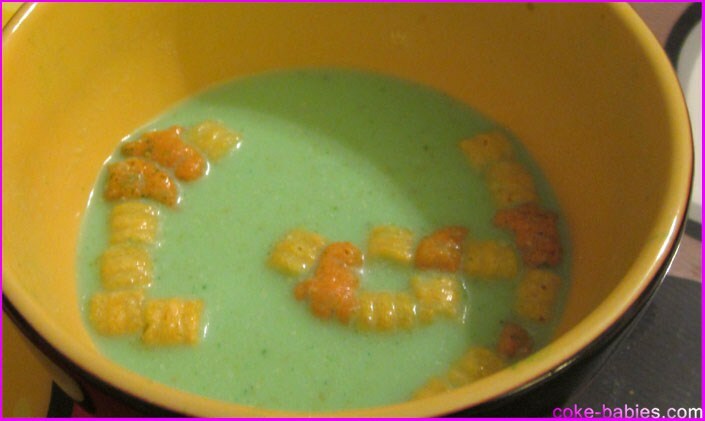 If the Hulk had a cereal, this is the color the milk should become. So kudos to the Cap’n for his solid Halloween release. 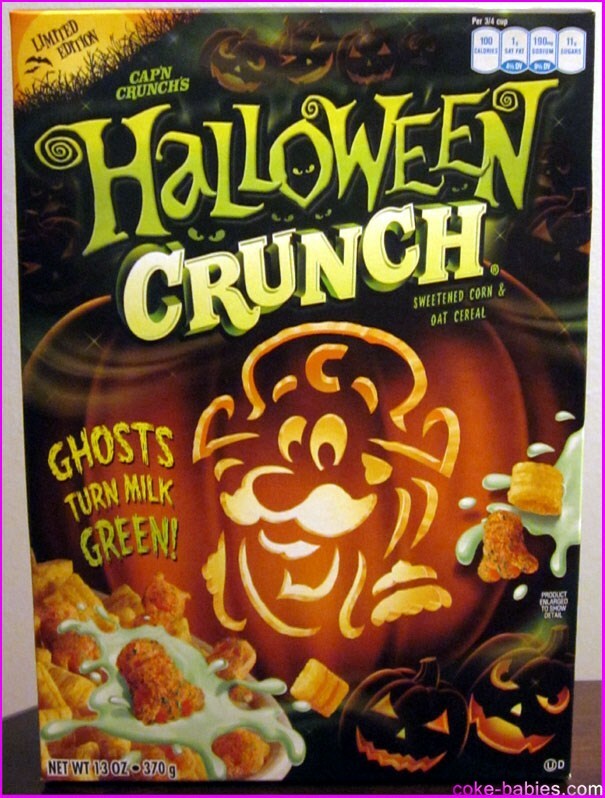 Halloween Crunch is fully themed, from the box to the cereal to the gimmick. Next year, include a prize in the box and it will cement Halloween Crunch in the holiday-themed food hall of fame.